Treatment requires dedicated therapeutic settings and providers trained to encourage patients to relinquish their caregiving roles and receive help themselves. When it comes to substance use and abuse, members of the helping professions, such as social workers, psychologists, doctors, and nurses, are at as great a risk—if not greater—than the rest of the population. With high-stress jobs and burnout always a possibility, some may turn to drugs or alcohol to keep going or to relax. But when addiction takes hold, there is no easy escape, and professionals battling the disease may have even greater obstacles to hurdle. A focus on professionals with substance use disorders reveals that there are some specific challenges for this population. For one, research suggests that professionals such as social workers may be reluctant to seek help for addiction. In fact, a study published in Social Work found that social workers do not frequently seek help, even when they are high-risk alcohol and drug users (Siebert, 2005). There are several approaches when it comes to the best treatment protocol for professionals with substance use disorders. Many lean toward a 30-, 60-, or 90-day residential program, and some state licensing boards require that. Chris McCoy, LMSW, CAC-II, a recovery specialist with the Recovering Professional Program in Cayce, South Carolina, works with several licensing boards to meet their specific requirements and says they can vary greatly based on the profession. Many of the patients at the Recovering Professional Program did not voluntarily refer themselves to the program. McCoy says the program’s emphasis is on total abstinence and learning chemical free coping skills. At the Methodist Richardson Medical Center’s Impaired Professional Recovery Program in Dallas, a 30-session outpatient program is tailored to the patient. Bob Good, LCDC, says that in comparing the disease-specific and sobriety maintenance content of 30-, 60-, and 90-day residential programs, he believes that the 90 hours (three hours per day on three days per week) patients spend in his program is potentially more intense. It’s a cognitive therapy-based program focusing on education-based skills training. The length of stay in residential programs and the overall duration of treatment may vary by patient and profession, but there is a strong argument that healthcare professionals need extra attention, no matter what the program. For instance, the residential treatment program at Hazelden in Center City, MN, lasts an average of 28 days for the general population, but for healthcare professionals, it’s generally 60 to 90 days. Marc Myer, MD, director of the healthcare professionals program at Hazelden, says the reason for the longer length of treatment for healthcare professionals is typically because treatment for this group is more complicated. For example, the likelihood of a healthcare professional having a comorbid psychiatric illness is higher. A recent study published in Addictive Disorders & Their Treatment found that more than two-thirds of healthcare professionals with a substance use disorder reported a comorbid psychiatric disorder with major depression accounting for approximately 40% of these cases and 58% reporting the use of psychiatric medication (Rojas, Brand, Fareed, & Koos, 2012). In fact, all of Social Work Today’s expert sources report that one of the biggest challenges that can arise when working with helping professionals is their own difficulty in taking on the patient role. Black says therapists coming in for treatment normally struggle making the transition from care provider to patient since therapy is a mode of treatment for addiction. Fitch adds that coming into a treatment facility for professionals and then throwing oneself into a helping role also may be a way of coping or keeping busy rather than accepting the need for treatment. Relapse is a possibility with any addicted population, and whether professionals are more or less likely to relapse is a point of contention. McCoy says there is a silver lining to the idea that healthcare professionals make difficult patients: their internal motivation to maintain licensure and successfully complete the program—and maintain that lifestyle—can be quite compelling. He says the physicians served through the program often are the most successful given their drive. Black says it’s important to talk to the patient’s family about the possibility of relapse, or “return to use,” which is becoming the preferred terminology. — Lindsey Getz is a freelance writer based in Royersford, PA, and a frequent contributor to Social Work Today. What Does the Code of Ethics Say? The first Code of Ethics was ratified and adopted by the National Association of Social Workers (NASW) in 1960 and at that time, there was no mention of issues of impairment. When a second code was drafted in 1979, it still failed to address the issue. In fact, it wasn’t until 1994 that the issue of impairment was addressed. Roja, J. I., Brand, M., Fareed, S., & Koos, E. (2012). Psychiatric comorbidity in health care professionals with substance use disorders. Addictive Disorders & Their Treatment, epub ahead of print. Siebert, D. C. (2005). Help seeking for AOD misuse among social workers: Patterns, barriers, and implications. 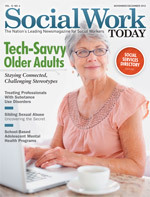 Social Work, 50(1), 65-75.